LONDON, 21st March 2018 – Pan-Asian restaurant wagamama today launches wagamamago, an app that it describes as ‘Uber for diners’ allowing customers to walk in, order, eat and for the first time ever, simply go. The new app will save diners an average of 12 minutes at every meal, according to research. It has been created in partnership with Mastercard, which has a long history with wagamama, and integrates with the restaurant chain’s existing Oracle Hospitality restaurant management platform. It was the first restaurant to use Mastercard Labs’ Qkr! pay-at-table platform in 2015. Since then a variety of leading UK chains have followed suit. While wagamama will still use Qkr, it also wanted to create a dedicated own-brand option for frequent customers. It has used the Qkr APIs which Mastercard is opening up to help power new ways to order and pay throughout the hospitality industry. Through the Qkr APIs, Mastercard allows its hospitality businesses to easily integrate ordering and payment services into their digital solutions, linking the point of sale terminal and payments to deliver a first-class experience for their customers. By connecting to a Masterpass digital wallet, payment can be taken automatically from the app without the need to hit a pay button; the first time any restaurant chain in the world has ever offered a “walk out” payment option in this way. The new app is available across the entire estate of wagamama restaurants nationwide. The Mastercard checkout process, which uses the Masterpass digital wallet, is supported by the highest levels of security and cryptology. 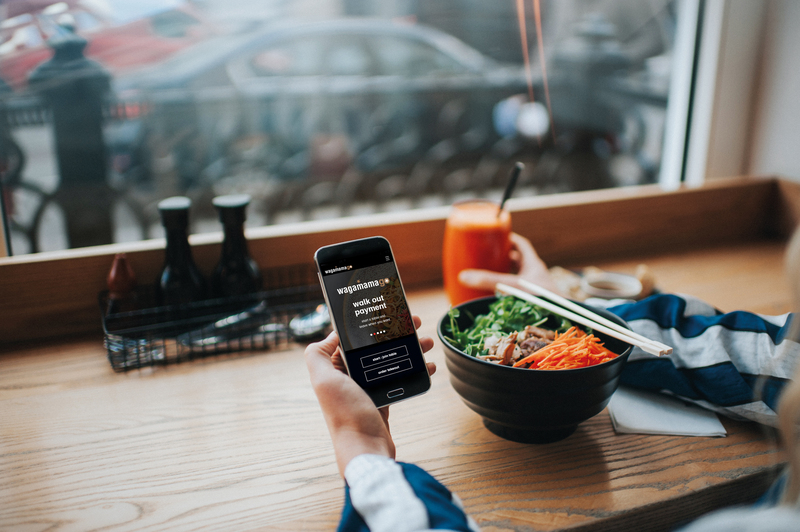 Available for free on iOS and Android, wagamamago also allows customers to order more items from their phone, split the bill and order takeaway, for those on the move. The purpose of the app is to allow a faster and more seamless dining experience for customers. Research shows that it takes an average of 12 minutes between asking for the bill to leaving the restaurant, and customers are four times less likely to recommend a restaurant if they have had a bad ‘bill experience’. The wagamamago™ app is completely safe and secure, developed in partnership with Mastercard which processes 65,000 secure transactions a minute. The Mastercard checkout process, which uses the Masterpass digital wallet, is supported by the highest levels of security and cryptology. Last year saw wagamama’s most successful financial year since opening its doors in 1992. The pan-Asian restaurant brand has also seen huge success with the launch of its test and innovation kitchen, noodle lab, based in the heart of Soho. noodle lab allows customers to try new items in development, before they launch on the menu. Restaurants can easily introduce new services like takeaway and delivery, and use the digital platform for reward programmes and targeted promotions directly to customers. Its’ web-based, management portal helps retailers view and manage menus, product inventory and pricing. ‘kaizen’, meaning ‘good change’ is the philosophy that sits right at our heart. It shapes every dish we create, and pushes us to find better ways in all that we do. We’re restless spirits, forever creating and making things better. We’ve been practising kaizen since 1992, when we opened our first doors in London’s Bloomsbury. Inspired by fast-paced, Japanese ramen bars and a celebration of Asian food, wagamama burst into life. We set out to create a unique way of eating; bringing the fresh, nourishing, flavours of Asia to all. A little ginger to warm you up. Chillies that kick. Noodles to nourish the body and soul. Our Asian inspired menu has been created to soothe, nourish, sustain and inspire. Pick from all kinds of rice and noodle dishes, alongside fresh salads and shareable sides. There are desserts, fresh juices, hot drinks, wine, sake and expertly crafted Asian beers too. In the name of kaizen, our standards are high. Our ingredients are cooked fresh, served fresh. Every bowl and plate that we fill with them is served as soon as it’s ready. The colours and aromas, flavours and spices are always at their best when they touch your table. A warming bowl of bold ramen teppan griddled to perfection or if you would rather rice, you’re in luck – our menu features many Japanese favourites. Fresh, authentic menus that are updated seasonally. wagamama is a staple of modern Asian cuisine.